The trains used for the Sungai Buloh-Kajang (SBK) Line are lightweight, built with sustainable and non-flammable materials, and has high recyclability at the end of their service life. It employs highly efficient air conditioning and lighting systems to reduce energy consumption. All MRT trains have wheel-chairs already fitted out in the trains for people with the disability of walking. 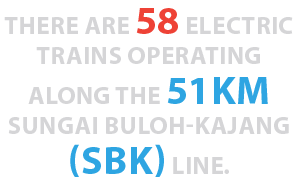 There are 58 driverless trains for the SBK Line. The trains were assembled at Rasa, Hulu Selangor. The speed of the trains can go up to 100km/h. However, the average speed the trains operate at is 70km/h. The design of the MRT train is inspired by the various modern and beautiful architectural features of Kuala Lumpur such as the Petronas Twin Towers. The design of the MRT train is themed “The Guiding Light” which represents strong and solid character as well as modernity and timelessness. They are designed by BMW Group Designworks USA and engineered by renowned train manufacturer Siemens AG. The interior design of MRT trains is visualised as an open environment that is inviting, light and fresh, incorporating long-lasting and easy to maintain colours with seats in cool blue tones that will alternate in a three tonality rhythm.